Betula nigra mature trees. 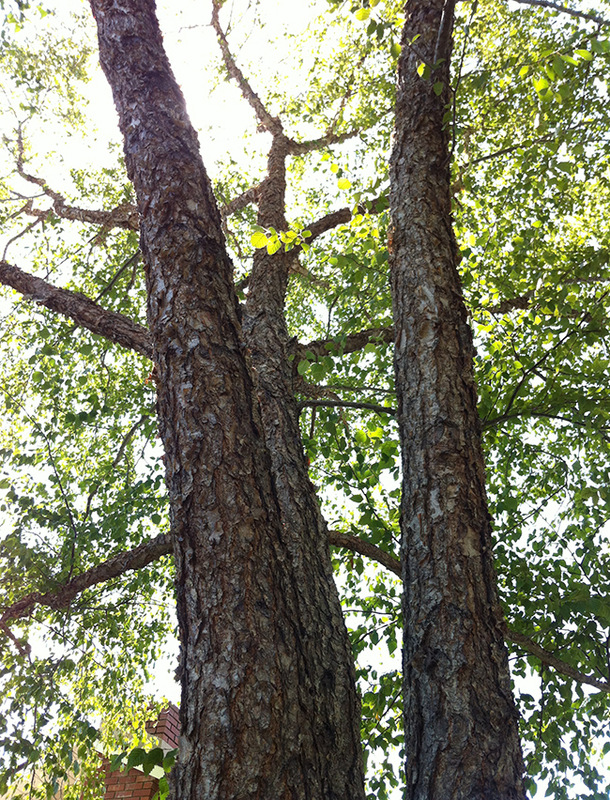 Betula nigra – canopy – Dr. Matt Ritter. selectree.calpoly.edu (Accessed 11/2017). Betula nigra is a tree to 30 m tall (smaller in NYC); young bark orange-brown, peeling, shaggy; old bark rough, scaling, twigs hairy. Betula nigra trunk. Betula nigra – young bark – Dr. Matt Ritter. selectree.calpoly.edu (Accessed 11/2017). Leaves egg-shaped, to 8 cm long, sharply double toothed near tip, entire near base, stalk fuzzy. Flowers monoecious; very small, male flowers in dangling catkins, wind pollinated blooming first; female catkins held upright; both blooming March-April. Fruit dry, small winged nuts, wind and water dispersed in late spring; germinating quickly on bare, moist soil (Del Tredici 2010). Seeds, buds and catkins eaten by many birds and mammals (Martin et al. 1951). 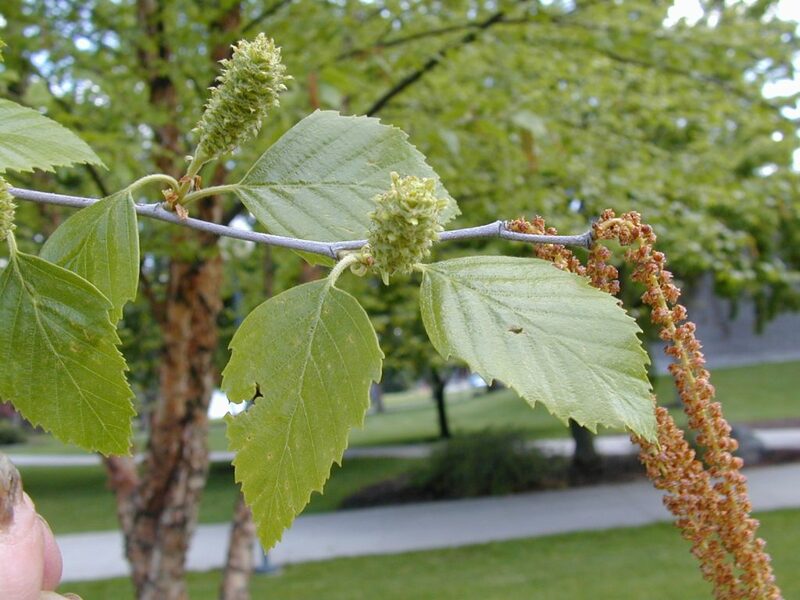 Betula nigra flowers. Peter Shaw. Trees of Santa Cruz County. treesofsantacruzcounty.blogspot.com (Accessed 11/2017). Frequency in New York City: Infrequent. Origin: Native. Southern NYS is the northern limit for natural populations. Habitat: Swamp forest edges, flood plains. Intolerant of shade. Moderately flood tolerant. Tolerates soil pH 3-6.5 (USDA, NRCS 2010). Tolerant of drought and heat, flooding or saturated soil up to 25% of growing season. Intolerant of shade, index 2-4. Intolerant of salt (Hightshoe 1988). 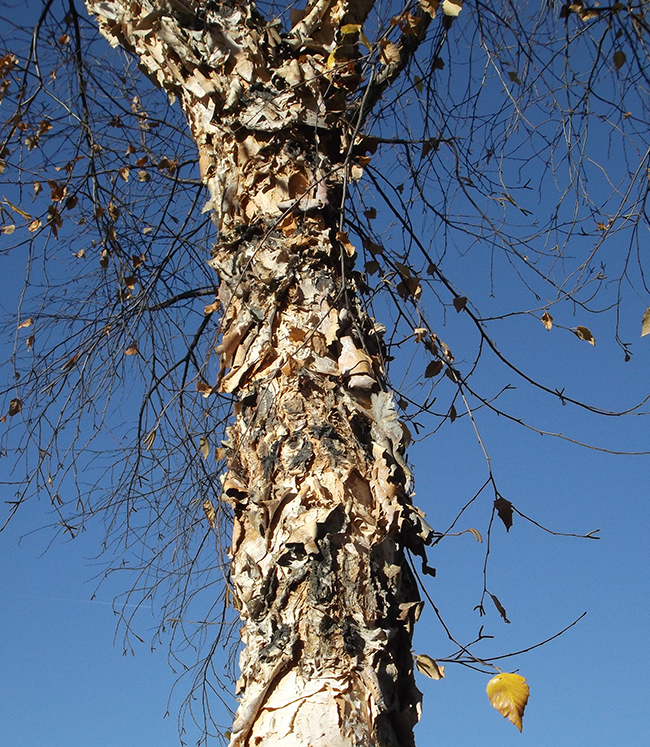 Del Tredici (2010) lists Betula nigra as tolerant of road salt and soil compaction, and resistant to leaf miner and bronze birch borer. Notes: Twigs eaten by deer (Martin et al. 1951). Sometimes infected by the anthracnose Gloeosporium betulinum (syn. Discula betulina, Deuteromycotina, Coelomycetes), which kills leaves. The symptoms of this disease are brown patches surrounded by yellow tissue on leaves. (Burns and Honkala 1990; Sinclair et al. 1987).